If you don’t want to have the files stored in one zip file, FBackup can make exact copies of the backup sources using “mirror backup”. Since FBackup will also back up empty folders, you can use this backup type to create in the destination a “mirror” copy of the original files. So it’s not only a file backup software. For each backup job, you can define an action to execute before or after the backup. For example, you can select “Clear backup” before the backup runs, so that all the previous backed up files will be cleared before loading the new ones. As an after-backup action, you can set it to stand by, log off, hibernate or even shut down the computer once the backup has successfully finished. The two main functions of a backup program are the backup and restore operations. FBackup makes them easy for you by offering friendly wizards. You start a new backup wizard, select “what,” “where,” “how,” and “when” to backup, and the backup is ready to run. If you have to restore files, you’ll open a restore wizard and it will ask you “where” you want the files to be restored. FBackup automatically checks for updates weekly, so you’ll know when a new version is released. The option to check for updates can be disabled, but we recommend that it is enabled so that FBackup will be up-to-date. By default, your backups will be stored on the local Windows partition. 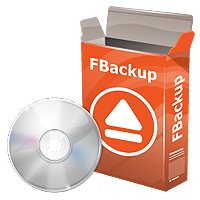 To be sure you have a secure backup, we highly recommend you to store the backups on other destinations supported by FBackup (such as an external USB/Firewire drive, or on a mapped network drive). This way, if your computer suffers a hardware failure, you’ll have your data safe on an external location. You can load plugins for backing up or restoring specific program settings or other custom data (like game saves, email data, etc.). Once loaded in FBackup, these plugins will list the sources needed to be backed up for that particular program in “Predefined Backups”. If a file is in use by another program at the time of the backup, FBackup will still be able to back up that file, because it uses the Volume Shadow Service that Windows provides. So, as long as you’re using Windows XP, Windows Vista, Windows 2003 Server, Windows 2008 Server or Windows 7, FBackup will back up those open files. As an example, you will be able to back up your Outlook emails and settings without closing the program first. You can choose a language for the user interface from the languages currently supported.